Some days ago, HP released version 12.5 for it’s StoreVirtual platform (StoreVirtual 4000 storage/StoreVirtual VSA software). Two-node quorum, which allows for a Quorum Witness in a two-node configuration. The Status of Quorum Witness is displayed in the output of the getNSMInfo and getGroupInfo commands. Support for iSCSI split network. Information about the split network (which network interface being used) is displayed in the getNSMInfo (NSM category) and getGroupInfo (NIC category) commands. Beside the Virtual Manager and the Failover Manager (FOM) this is now another possiblity to configure a tiebreaker for a two node cluster. The advantage of the Quorum Witness over the already existing tiebreaker is, that it does not require access to the iSCSI network (routing iSCSI traffic to a third location might be a problem). The Quorum Witness only requires a NFS Version 3 fileshare that must be accessible by the two VSA Managers. 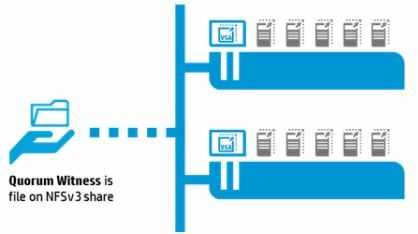 The share should have write permissions and a maximum latency of 300ms.